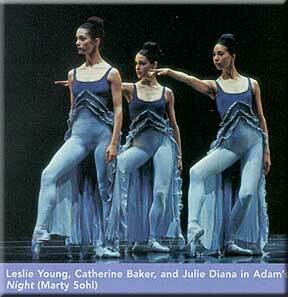 The San Francisco Ballet's Repertory Program #6 opens with Julia Adam's "Night." This is a dreamy piece with most of the characters in steel blue with a lot of ruffles and a dark background. It's a ballet of contrasts and shapes, and as much as anything, a showcase for the ballerina, Tina LeBlanc, who is as good as it gets. She's partnered by Benjamin Pierce, whose brother Matthew composed the music. The curtain rises on Pierce in a prone position on the floor. He stretches, buckles, rolls over and up, then back down. LeBlanc is sleeping on what appears to be table at the side, but it's revealed to be the backs of three guys. She awakens, Pierce lifts her high, rolls her over, and spins her around. The music builds in "Parsifal" like waves, and she lies back down. 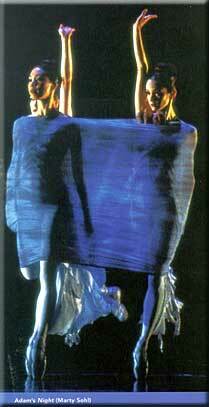 The next dream has three girls wrapped together with a piece of blue cloth. The movement is kinetic and sharp, but still smooth. Three men rise up, kick and ripple across the floor in waves. They lift Tina, roll her down their backs, and Pierce lifts her high. LeBlanc flies in twirling spins and thrusts while another girl and guy and do a slow pas de deux. They pick up speed and Tina slows down. Sometimes she seem almost boneless as she wraps her body around someone else, then takes off flying as if on legs of elasticized steel. Tina LeBlanc is a truly amazing dancer. She's small and light, and I have never seen anybody move with such ease and grace. I've seen Darcey Bussell do things I've never seen anyone else do, and some things I've never seen anyone else try, but I've never seen anyone move with such a natural fluidity as Tina LeBlanc. With Tina you get the feeling she learned to dance before she could walk, and dance is her primary form of movement. Julia Adam's "Night" is one of the most evocative and sensuous dance pieces I've seen in a long time. It was the highlight of the evening and a piece I definitely want to see again. The San Francisco Ballet is a hotbed of creativity under Helgi Tomasson and Julia Adam is a choreographer to watch. 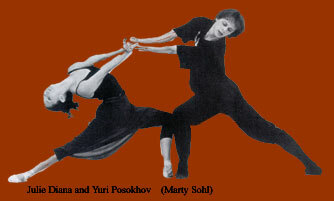 San Francisco will do the World Premiere of another of her works on Program 5 in April of 2002. Roland Petit's "L'Arlesienne" is a strange piece. The backdrop of most of it is a big picture of Vincent Van Gogh's "Wheatfield with Mountains and Sun." The music is Bizet's "Suite," and it's definitely Arles. This is one of the most symmetrical pieces I've ever seen. It's almost as if the ensemble were cast for size as much as skill. All of the girls are about the same size, as are all of the guys. It opens with them all lined up at the rear with the men lined up to the left, the women about a head shorter, to the right. It's pretty jarring. They stay this way most of the time in lines of "V's." Lucia Lacarra's Vivette is in love with Frederi, but he's haunted by a vision of a girl he once saw, and can never have. She flirts enticingly, but he keeps pushing her away. She leans over and touches his cheek, but he pulls away as if in a dream. As she stands, leaning over with her hand out, he moves to the back of the stage, crying out, and back to the front where he resumes his position with her hand touching his face. The other couples pair off in a perfectly symmetrical circle. They do a pas de deux. He pulls one way, she another. He lifts her, they are lifted and carried by others , and they come down, hold their hands high, as other couples go under them. In the final act, the back drop is an open window, that almost looks like the inside of Vincent's yellow house. Pierre Francois Vilanoba is descending into madness as he kicks straight out frantically, scissors, and splits across the stage. He spins and leaps, his hair flies everywhere, and sweat pours off him as he manically thrusts with dazzling footwork and commanding presence, finally taking a flying leap out the window as the curtain falls. One of the the most interesting things about this program is the contrast of male dancers between the French Vilanoba and the three Russians in the final work. Vilanoba stays pretty earth-bound but his footwork is dazzling and his acting supreme. As high as the Russians fly, he kicks every bit as far horizontally. One of the real beauties of San Francisco Ballet is the mix of dancers. Russians are trained one way, the English, French, and Americans, in their own ways. Bolshoi, Kirov, Paris Opera, and Royal Ballets are primarily their own dancers trained for them. San Francisco has a fascinating mix, and this Program, more more then most shows that mix, and no more then right here. The program concludes with "Symphony in Three Movements" of Stravinsky, choreographed by Balanchine. This is predominantly an ensemble piece that opens with two groups of eight girls lined up on a diagonal. There's nothing earthbound here as Yuri Posokhov, Roman Rykine, and Guennadi Nedviguine leap high , then lift their ballerinas, Julia Adam, Julie Diana, and Vanessa Zahorian. We have dazzling layered groups of dancers meshing from front to back and side to side. In the extended pas de deux the danseur lifts his ballerina straight out over his head and carries her across the stage. They do big lifts, spins, and twirls, and are finally joined by the ensemble in this lively Repertory Program 6. Scott Speck, Emil de Cou, and Paul Hoskins led the San Francisco Ballet Orchestra.